Data show that seniors in Canada were more likely to be the victim of family violence in 2017 than they were nearly 10 years ago, according to information reported by police. Over the same period, the rates of police-reported family violence against children and youth and rates of intimate partner violence have declined. From 2009 to 2017, the rate of police-reported family violence against seniors rose 7%. 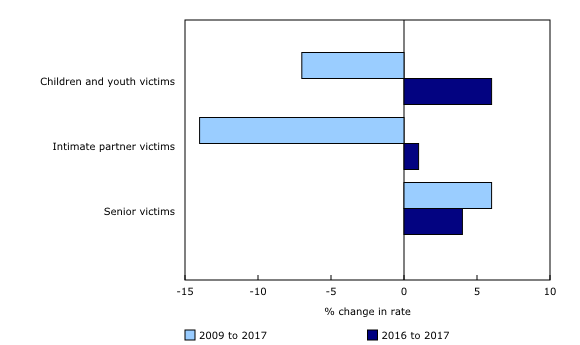 In contrast, rates decreased for child and youth victims of family violence (-7%) and for victims of intimate partner violence (-14%). Family violence has a significant impact on the health and well-being of Canadians of all ages. Identifying who is most at-risk for this type of victimization is important to ensure that programs and services are available for those in need, particularly because this kind of violence is often hidden from public view. Self-reported data from the most recent General Social Survey on Canadians' Safety show that most child abuse and spousal violence is never reported to authorities. The annual Juristat publication, "Family violence in Canada: A statistical profile, 2017," is released today in the form of fact sheets covering three topics: family violence against children and youth, intimate partner violence and family violence against seniors. An infographic illustrating selected data on family violence in Canada is also released today: "Police-reported family violence in Canada, 2017." According to the census, people aged 65 and older accounted for approximately 17% of the Canadian population in 2016, up from 14% in 2006. As the senior population in Canada continues to grow, senior abuse has emerged as an important issue. There were 11,380 seniors aged 65 and older who were victims of police-reported violence in 2017. This corresponded to a rate of 194 victims per 100,000 seniors. One-third were victimized by a family member, representing a rate of 64 victims per 100,000, up from 60 per 100,000 in 2009. There was also a year-over-year increase, with family violence against seniors rising 4% from 2016 to 2017. In 2017, rates of police-reported family violence were higher for senior women (70 victims per 100,000 population) than senior men (58 victims per 100,000 population). Close to two-thirds (63%) of all senior victims of family violence had physical force used against them, while almost 45% sustained an injury. In 2017, there were 59,236 child and youth victims (aged 17 and younger) of police-reported violence in Canada. Of these, 30% were victimized by a family member. The rate of police-reported family violence against children and youth declined by 7% from 2009 to 2017, despite a 6% increase from 2016 to 2017. Family violence against children and youth was more common among female victims (32%) than male victims (27%). Rates for physical assault were similar for female (138 per 100,000 children and youth) and male (142 per 100,000 children and youth) victims of family violence. However, females were more likely to be victims of sexual offences (134 per 100,000 children and youth) than males (27 per 100,000 children and youth). Among child and youth victims of police-reported family violence, 58% were victimized by a parent. Intimate partner violence includes violence committed by a current or former legally married or common-law spouse, dating partner or other intimate partner. In 2017, close to one-third of all police-reported victims in Canada were victims of intimate partner violence (95,704). As has been the case in previous years, females were over-represented, accounting for almost 8 in 10 victims. In fact, violence committed by an intimate partner (45%) was the most common type of violence experienced by female victims of violent crime in 2017. From 2009 to 2017, the rate of intimate partner violence decreased by 14%. However, the rate of intimate partner violence was relatively stable from 2016 to 2017, rising 1%. In 2017, 15% of victims of police-reported intimate partner violence were involved in an incident where a weapon was present. Knives were the most common weapon (31%). In contrast, 72% of intimate partner violence victims experienced physical force without a weapon, while 6% were threatened with death or injury. More than half (58%) of all victims of police-reported intimate partner violence sustained an injury. These findings were similar for both female and male victims. Rates of police-reported family violence were higher in rural areas than in urban areas. Compared with urban rates in the provinces, rural rates were 1.9 times higher for child and youth victims of family violence, 1.7 times higher for victims of intimate partner violence, and 1.5 times higher for senior victims of family violence. Similar to police-reported crime in general, rates of violence for these three populations of interest were highest in the territories. The report "Family violence in Canada: A statistical profile, 2017" is produced by the Canadian Centre for Justice Statistics under the Federal Family Violence Initiative. It provides the most current data on the nature and extent of family violence in Canada, as well as trends over time. Three separate fact sheets present overviews of police-reported family violence against children and youth, intimate partner violence and family violence against seniors. The fact sheets use police-reported data from the Incident-based Uniform Crime Reporting Survey and the Homicide Survey. Family violence refers to violence committed by parents (biological, step, adopted and foster), children (biological, step, adopted and foster), siblings (biological, step, half, adopted and foster), extended family members (e.g., grandparents, grandchildren, uncles, aunts, nephews, nieces, cousins and in-laws) and spouses (legally married, separated, divorced and common-law). Intimate partner violence includes violence committed by current or former legally married or common-law spouses, dating partners and other intimate partners. Data on weapons and level of injury exclude data from the province of Quebec due to data quality concerns. An urban area is defined as a census metropolitan area (CMA) or a census agglomeration (CA). Rural areas are all areas outside of CMAs and CAs. The article "Family violence in Canada: A statistical profile, 2017" is now available as part of the publication Juristat (Catalogue number85-002-X). The infographic "Police-reported family violence in Canada, 2017" (Catalogue number11-627-M) is also released today.